This is just yummy no other way to describe it! In the Middle East you will see Shwarma shops on every corner! It is like a Gyro but different. It is chicken or lamb cooked up and sliced and put into Arabic bread with pickles, garlic sauce, french fries and wrapped up. Using my Kufta recipe put this sandwich together. 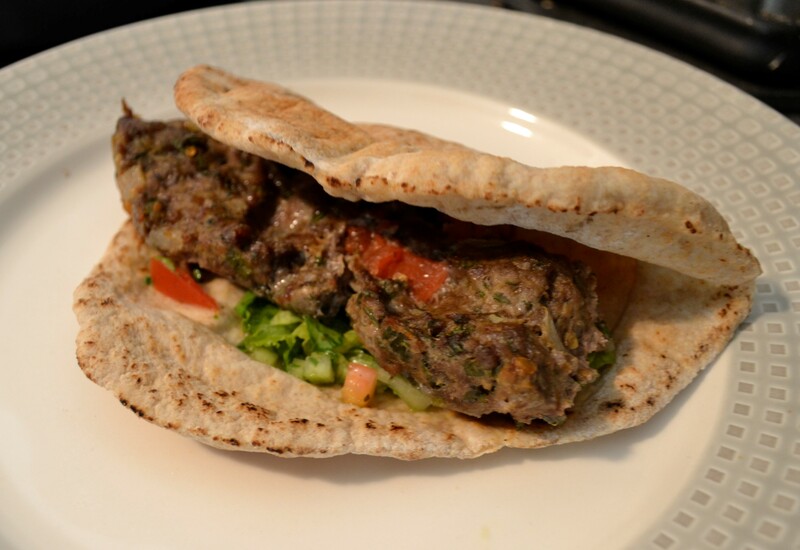 Put a spoon of yogurt or hummus on Pita or Greek bread ( later I will give step by step pictures and instructions on making Arabic bread) then some Middle Eastern Green Salad (see recipe) place a piece of cooked Kufta (see recipe) wrap up and delcious!! If you do not have Pita bread available, you can use any bread!! I love Middle Eastern food. My husband is of Malay/Javanese ethnicity from Singapore. I was surprised to see the Arab influence in the Malay recipes. The majority of Malay are Muslim so there is a lot of meat and rice dishes that were taught to them hundreds of years ago when they had converted. Wow interesting! I would have never thought that!